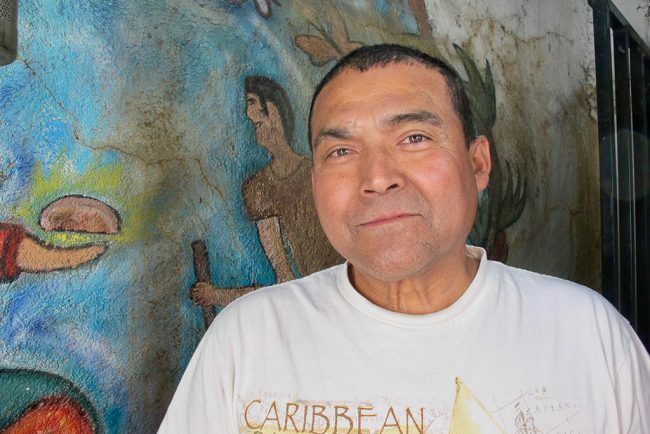 After 35 years in the U.S., Enrique was detained and deported to Nogales, Sonora, where he encountered the KBI. Enrique was deported and arrived at the KBI recently after 35 years in the United States, the last two spent in detention. Now, he faces an uncertain future as he pursues a visa to reunite with his children and the grandchildren he has never met. Born in Mexico, Enrique has lived most of his 55 years in the U.S.—working, marrying, and raising two sons, both U.S. citizens. Two years ago, he was arrested and detained; this past month he was deported to Nogales, Sonora. Not knowing anyone there, he relied on the KBI’s direct aid for several days to get on his feet, make friends and connections, and look for work and decide his next steps, given the difficulty of obtaining a legal path to enter the U.S. where most of his family live. The number of undocumented parents like Enrique who are separated from their children through deportation has doubled at the KBI in the past year. His experience, below in English and Spanish, illustrates the dire consequences of unreasonably long detention and deportation—extended separation from family with no assurance of reunion, loss of livelihood and home, the challenge of starting over alone—and underscore why the KBI strongly advocates for a humane immigration policy that eliminates such life-altering disruption and trauma and keeps families together. My name is Enrique. I lived in Phoenix, Arizona for 4 years. I arrived here [to Nogales, Mexico] after being detained in Eloy, Arizona by immigration agents, and they deported me to Nogales. I’m from Nuevo Laredo, Tamaulipas. I have family in Alabama, Florida, and Phoenix, Arizona. I first came to the United States seeking a better life and a better job. I was in the US in ‘82, I was 20 years old—I married a US citizen. I was married for 22 years and then got a divorce. I was in the U.S. for nearly 35 years. I was a plumber, and worked in construction. I built houses as well. I have two sons—one is in Alabama, and the other lives in Florida. I have a 4-year old grandson in Florida who I haven’t met yet. My son has petitioned for my legal residency in the U.S. I’m waiting to see if I can obtain a visa. It’s been a year since he submitted the application, so it may be in the next few months that they review it. My oldest son is 34, and the younger is 32. They’re grown up. I’m 55 years old. My first son was born in 1982, and the other in 1984. [At Eloy], the majority of the people complain about the conditions there—the food isn’t very good, nor is the medical care. It’s not a good place. Two years is a long time to be incarcerated just for not having papers or a green card. It’s just like being in prison. There are people who are given lesser punishment for worse crimes. It’s sad, indeed, but that’s in the past now. I was really desperate for a while. Now I’m content to be out of there. This is the first time I’ve been to Nogales. I don’t know the border here in the state of Sonora—only the border of Tamaulipas and Texas. I’m going to establish myself here a bit and find a job. I talked with my family yesterday. They’re going to help and support me as well. I have uncles who live in Nuevo Laredo, but it’s been many years since I’ve seen them. The majority of my family live in the U.S. My parents, my brothers, my sisters… I feel sad and alone [being far from them]. But here I’ve found there are many friends and people helping out. I hope my visa is approved soon so that I can return to the U.S. and be with my family, and travel to meet my grandchildren, who I don’t know yet. My grandson is 4-years old and lives in Jacksonville, Florida. [My son and his family] were without electricity for three weeks [because of the recent hurricane]. They’re well now. I think that the United States needs to make immigration reform happen for immigrants. And they should support migrants instead of continuing to be against them. In my opinion, I think [President Trump] is very racist and anti-immigrant. That’s my personal opinion. […] We come to work and lead an honest life, right? And seek dignified work. * There are two forms of deportation employed by the U.S. Department of Homeland Security: (1) voluntary returns, which allow individuals to essentially deport themselves at their own expense, with fewer repercussions upon re-entry, and (2) removals, that is, more formal compulsory deportations implemented by the U.S. government and carrying 5- to 10-year bans on re-entry as well as harsher penalties should the deported person cross into the U.S. again. We are not certain which method was used to deport Enrique since it is common for individuals who represent themselves to be unfamiliar with the legal intricacies of deportation. Mi nombre es Enrique. Vivía en Phoenix, Arizona, por 4 años. Llegué aquí a Nogales—caí en el centro de detención de Eloy, Arizona, de migración, y me deportaron por Nogales. Soy de Nuevo Laredo, Tamaulipas. Tengo familia en Alabama, Florida, y Phoenix, Arizona. Vine para hacer una vida mejor, un mejor trabajo. Yo estuve [en los Estados Unidos] en la 1982, tenía 20 años, me casé con una ciudadana americana. Estuve casado 22 años, y luego me divorcié. [Estuve en los Estados Unidos] 35 años, casi. Era plomero, e hice construcción. Hacía casas también. Tengo dos hijos, está uno en Alabama, y otro en Florida. También tengo un nieto en Florida de 4 años que no conozco todavía. Mi hijo metió una petición para mi residencia [en Estados Unidos]. Estoy esperando que se pueda.. para arreglar mi visa. Hace un año que metió la aplicación y puede ser en los siguientes meses que la cierre. Mi mayor hijo tiene 34, y el menor tiene 32. Ya son adultos. Yo tengo 55 años. Nació el primero en 1982, y nació el otro en 1984. A mí me agarraron y me detuvieron por no traer mi green card. Estuve en el centro de detención allá, en Eloy, por dos años, hasta que me botaron ayer. Estaba apelando mi caso para ver si me cancelaban la deportación, pero me dieron la salida voluntaria. [En Eloy], la mayoría de la gente se quejan allí, la comida no está muy buena, el tratamiento médico. No está muy bueno. [Dos años] es mucho tiempo para estar encerrado por no tener papeles, por no traer la green card. Es como si estuviera en la prisión. Hay gente a que le da menos castigo por crímenes más grandes. Sí, es triste, pero ya pasó esto. Estaba muy desesperado. Estoy contento porque ya salí. Es la primera vez que estoy aquí en Nogales. No conozco la frontera de Sonora. Yo conozco la frontera de Tamaulipas y Texas. Voy a quedarme aquí un rato y encontrar un trabajo. Hablé con mi familia ayer. Ellos me van a apoyar y ayudar también. Tengo tíos en Nuevo Laredo, pero hace muchos años que yo los veía. La mayoría de mi familia está en Estados Unidos. Mis padres, mis hermanos, mis hermanas. Me siento triste y solo [al estar lejos de mi familia]. Pero aquí hay muchos amigos y gente que ayudan. Espero que aprueben mi visa muy pronto para poder llegar a Estados Unidos, con mi familia, e ir a conocer a mis nietos que todavía no conozco. Tiene 4 años y está en Florida, en Jacksonville, Florida. Estuvieron sin luz por 3 semanas [por el huracán]. Están bien. Pienso que los Estados Unidos debe hacer más reforma migratoria para los inmigrantes. Y apoyar más a los migrantes, en vez de ser más antiinmigrantes. En mi opinión yo creo que el [Presidente Trump] es muy racista y contra los inmigrantes. […] Nosotros venimos a trabajar, y hacer una vida honesta, ¿verdad? Con un trabajo digno.